Hey Gabaldon! Stop fooling around with this half-assed zombie gay mysteries of the 18th century crap and get Jamie and Clare back on track! 3.5 starsSet in 1761 on Jamaica. Lord John has been sent with a battalion of troops to quell a rebellion on the island. Along the way he mixes it with snakes, spiders, escaped slaves, Geillis Duncan, and of course, zombies.Not quite as good as some of the other stories in the series. But with a fair amount of research, and as ever, a deft hand, Diana Gabaldon brings readers another welcome chapter in Lord John's life. As per all of Diana Gabaldon's books, I loved it. As always the characters were well drawn, the story well told and the writing fabulous, using beautifully crafted English. The Lord John books are far cleaner than the Outlander books in the story telling and that is more my preferred style; so I find every Lord John book a refreshing read as well as a satisfying one. I like how they inform the Outlander series also.To anyone who is a fan of the Outlander series but who hasn't read the Lord John books, I strongly advise that you do ASAP. If you love the Lord John books and haven't yet read this, try to do so soon. If you've read the Outlander books and enjoyed some aspects but found them a little wordy, try the Lord John books, you'll be very pleasantly surprised by how comparatively crisp the writing is. I hope there are a lot more of them written. I enjoy every one of them and exploring John more deeply as a character, as he is simply fabulous and gets more so with each read. I am hopelessly addicted to Diana Gabaldon's fiction for a lot of reasons, most notably characters drawn with such depth that I feel (no believe) I have known them wherever they are in their travails in other times.I would never read a book about zombies unless lured there by Diana, and of course, her ever-compelling Lord John Grey. This novella takes you back to a time period (1761)when John finds himself in Jamaica to deal with a series of aggressions by the maroons. It's a brief whodunit but what's special about it is how Diana, once again, gives us a chance to understand a piece of the culture of the indigenous people there, including what a zombie is, how it's created, and how matters of magic are twisted for evil purposes by the indigenous and the "civilized" Brits who came there.Diana's prose is such a pleasure to read, her stories captivating, and her ability to keep me waiting eagerly for her next work extraordinary. Anyone who is a fan of Gabaldon knows it takes a long time for each installment in the “Outlander” series to come out, (like, several years) so these little interludes, in the form of short stories and novellas, are a great way to get your “Outlander” fix, while also filling in some gaps and backstory in the plot. However, while entertaining, “A Plague of Zombies” answers very little in that regard, but it is still a fantastic read. I was completely enthralled with the writing and the story, but the ending seems a bit rushed and incomplete. However, that's the only criticism I can give of this book. As is her style, Gabaldon carries her reader along with such a gentle touch that reading her books is like a vacation, as it should be. Her characters are vibrant and memorable, and if you’re a fan, this novella only reignites your interest in what comes next in the “Outlander” series. As Diana Gabaldon notes in her author's note preceding this story, Lord John Grey's status as an unmarried man of means allows the author the liberty of sending him to far-flung locations, despite the difficulties of travel in the late 1700s. So she takes a previously empty timeframe within the overall timespan of the story, finds something interesting going on in the world, and sends Lord John on his way there. This time it's Jamaica... and zombies. For this one, no real background from the rest of the Outlander series is particularly needed, and with its length SIGNIFICANTLY shorter than the Outlander books, it could be a good spot to see if you like Gabaldon's writing style. Where I got the book: purchased on Kindle.This is not really a novel, more a novella or longish short story. A rather lightweight story, too, with Lord John Grey in Jamaica getting mixed up with zombies. The best thing about it is Gabaldon's explanation of how zombiedom can be achieved without actually raising the dead; I also appreciated seeing Geillis Duncan aka Mrs. Abernathy, and would have liked more of her.One for the fans, definitely, but not the best one. Clever story written about a Outlander character we know and like. This and the other short stories written by Diana Gabaldon fill the gap while we wait for MOBY to publish at the end of the year. After reading the anthology this one was included in along with the author's notes, I understand why these stories get written and appreciate them better. Clever, clever Lord John, or is it just luck? Either way I love this character keep writing about him please! This novella did not change my life, but I enjoy me some Lord John. Most entertaining. And brief. And it sheds a lot of light on how on Earth Lord John Grey ended up being the governor of Jamaica. Bearing the title in mind, it may not sound so weird that I read the last chapter unable to get Michael Jackson's Thriller video and music out of my mind. I was dancing by the end! I just love Diana Gabaldon and Lord John Grey. Perhaps not as much as the ginormous Outlander novels, but still. I always enjoy John Gray’s stories! I like the sense of what else is going on at the same time as Outlander. It was decent. But, once again, Gabaldon has demonstrated her appalling lack of attention to chronology.This book takes place in 1761. Mrs. Abernathy is on the island, and her husband has died recently.But inVoyager, set in early 1767 by the time they're in Jamaica, it says this:Barnabas Abernathy had come from Scotland, and had purchased Rose Hall five years before ... Then, two years ago, he had married a woman no one knew, bringing her home from a trip to Guadeloupe ... And six months later, he was dead.So, Barnabas Abernathy came in 1762-ish, and Mrs. Abernathy showed up in 1765. But this novella takes place in 1761. To echo my previous reviews of Outlander, Dragonfly in Amber and Voyager: huh?? ?At least it explained Mrs. Abernathy's "zombie poison" fromVoyager. I found this story in an anthology and I have to say, while I just can't stomach time travelling heroines romancing Scottish lairds or whatever the Outlander books are meant to be about, I really don't think Gabaldon can do any wrong when it comes to Lord John Grey. He's just the perfect protagonist - brave but human, smart, instinctive, lucky, skilled and just a little flawed. In this story he plays diplomat-come-detective, travelled to Jamaica to quell an alleged slave uprising and instead encountering deadly mysteries to solve and chilling discoveries to overcome.For a short story, this was nicely creepy. The sense of time and place is amazingly vivid and Gabaldon's supporting characters are well fleshed out, given the work's length. Our hero faces a suitably dangerous trial in the end which, regardless of the expected outcome, still had me biting my nails. Another really, really good read in this series! I highly recommend it! This was my least favourite of the Lord John books.I did enjoy the part where he wakes from the dream about JAMMF and has to get himself together to investigate a zombie attack.There were a few hints here that set up scenes in the Outlander books, and perhaps I would have liked it more if I'd been reading the series chronologically.The story was well-researched and written, as one expects from Diana's work, but I didn't feel like it gave me much new insight into John himself. I think I was hoping for a little more from this one. It all just seemed so anti-climactic. I liked the story, and I think it was interesting to see some of LJG's escapades in Jamaica. I think I was just hoping for more to happen--like why introduce the Twelvetrees family and then kind of disregard them--I totally thought Nancy was in on something in the plot! But alas, it was fun to be back in the saddle with LJG, at least for a quick adventure. I love the Outlander series and put off reading about Lord John for a long time. I didn't think I would like him being a stand-a-lone character. How wrong I was! Now I cannot get enough of him. This is a fun short story that speaks of zombies but also of realism. Fun, Fun read. Now when is Lord John going to find a true love worthy of him???????? LJG has traveled to Jamaica to deal with an uprising of slave workers. He learns tales os zombies and voodoo practices. It was interesting, but nothing I'd read again. Reviewed for THC ReviewsA Plague of Zombies falls about one year after The Scottish Prisoner in the Lord John Grey series chronology. In this one, John has now been promoted to Lieutenant-Colonel and is finally the one in charge of the troops. He’s been sent, along with a number of other soldiers, to Jamaica to put down a slave revolt. As with most things in life, this isn’t as simple and straight-forward as it seems. As John starts looking into matters upon his arrival on the island, he starts to uncover government corruption and other criminal deeds, some of which have led to the slaves rebelling. Add in tales of the supernatural and John being attacked by what appears to be a zombie, and you have the makings of a fun and engaging read.As always John shows that he’s an honorable man who always tries to do the right thing, standing out in contrast to the corrupt officials who think nothing of using and abusing slaves, as well as engaging in other misdeeds. He also proves himself, once again, to be highly intelligent, methodically investigating the root cause of the slave uprising and later a murder, and of course, figuring everything out in due time. John gets to show his diplomatic side as well, when he must negotiate with the maroons (those who are essentially at the head of the rebellion) for the release of his men. In this, he also proves his bravery again, too. According to Diana Gabaldon’s author note, all of this is apparently in preparation for John eventually becoming governor of Jamaica, which is where he is when Jamie and Claire find themselves there in Voyager. Last but not least, I love that for a man from his time period, he’s almost surprisingly colorblind. In Custom of the Army, he had a very brief affair with a Native American, and although nothing comes of it this time, he, nonetheless, finds himself extremely attracted to one of the governor’s black servants in this story. So all in all, John is still the amazing hero I’ve come to love over the course of reading the Outlander series and now his own books.Overall, I really enjoyed A Plague of Zombies. Out of the shorter novellas of the series, this is now my favorite one. It may have partly been because the military theme was fairly minimal this time. But I think it may also have to do with it being a little more closely related to events in the Outlander books than some of the other Lord John stories are. Not only do we get to see John taking actions in Jamaica where he will eventually be in charge, but he also interviews Geillis Duncan who, of course, is now Mrs. Abernathy of Rose Hill plantation, right after her husband dies. Being the sharp investigator that he is, John almost immediately realizes that she’s probably guilty of murdering the man herself, although he has no proof, merely a hunch. John also briefly meets up with a couple of members of the Twelvetrees family who’ve been a thorn in his side, while trying to keep his duel with Edward Twelvetrees back in London a secret. The last thing that really made this novella pop for me was the zombie theme, which is really interwoven with the black African culture of the island. I don’t know if it’s actually possible to make a zombie as presented in the book, but I know Ms. Gabaldon is a master at research and if she included it, there must be at least some anecdotal evidence for such a thing. I think I’m an armchair anthropologist at heart, so I loved learning about the cultural aspects of voodoo and other mystical practices that the Africans brought with them, as well as how the former slaves escaped into the hills of the island. It all made for a fascinating story that kept me riveted throughout. A Plague of Zombies was originally published in the multi-author anthology, Down These Strange Streets, and was later republished as a stand-alone novella in eBook format. It’s most recent publication is in the single-author anthology, Seven Stones to Stand or Fall, along with several other Outlander related novellas. The Outlander universe is a lovely ocean to drown in, and these bite-size Lord John Grey stories are oh so lovely. In this prequel of VOYAGER, Lord John has been called to Jamaica to help advise and defend the governor from a suspected uprising. He is quickly up to his eyeballs in beautiful scenery, beautiful men, and some not-so-beautiful midnight shrieking, incompetent guards, and decaying zombie flesh. Gabaldon tries to capture the racial complexity of Jamaica and its slave trade, but is limited by both the book's very short length and her POV character (a white British man at the top of society). I think I enjoyed this book more because I had more a background understanding of Caribbean life at the time, from reading other fantastic novels like Isabel Allende's ISLAND BENEATH THE SEA or Marlon James' THE BOOK OF NIGHT WOMEN. Gabaldon's piece is only a snapshot of a complicated, tragic reality.Though this book was enjoyable, it lost a star from me because of the abrupt ending and the fact that Lord John did not get to kiss his new zombie boyfriend and I am DISAPPOINTED. I signed up for a gay old time and I only got half of it. Overall though, hearing Lord John's story made me even more eager to read VOYAGER, which I will promptly do. What can I possibly say about a Diana Gabaldon book that has not already been said?This is another wonderful novella with Lord John Grey as His Majesty's detective and he is going to have a lot on his hands with the odd murder of the appointed Governor of Jamaica. a slave rebellion threatening honest British farmers and a couple of zombies on the loose. Did I mention poisonous snakes and cockroaches? You'll get those as well.Needless to say, Author Gabaldon has given us Outlander fans another little gem; A Plague of Zombies gives us another glimpse of Lord John's character and through his interaction with some mysterious locals also an engrossing portrait of the contrast between two different cultures.As all the Outlander novellas, APOZ can be enjoyed as a standalone, but if you read it after Voyager, Big Book #3 in the Outlander series and now STARZ's third season in the Outlander TV show starting Sept. 10th (yaaay!! ), you'll see every single little piece of the story fall into its proper place inside the bigger picture. Engaging, but a bit too short Lord John Grey is one of my favorite secondary characters in the Outlander Universe. I've read and enjoyed every one of his stories and this one, though a bit shorter than I would have liked, is no less interesting and engaging. Set in the same period as Voyager, the 3rd book in the main series, Plague of Zombies gives a glimpse into Lord John's experience in Jamaica as he deals with a slave uprising. As usual, LJ manages the situation with a strong sense of duty, compass and good sense. I simply adore this man.My only criticism is that it ended a bit more abruptly than I would have liked leaving me to wonder the outcome for Cresswell and the maroon, Rodrigo. Surely one more chapter or a postscript would have allowed for that. 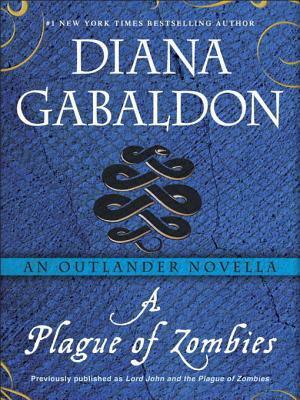 “A Plague of Zombies” is a novella originally published in an anthology of stories edited by George RR Martin. It stars our favorite minor character from Diana Gabaldon’s “Outlander” series, Lord John Grey. LordJohn is the Lt. Colonel sent w/ troopsTo Jamaica to quell a slave uprising in 1761. I only give it four stars b/c the story is getting good and creepy—w/ the Governor killed by a zombie and one of his servants turned into one. Lord John goes to speak to the leader of the maroons ( runaway slaves and descendants thereof), has a small adventure — and then the story ends. It really had some potential, and should have been a novel instead of a story in an anthology.